Is sugar the biggest enemy to your health? We all know that a large quantity of sugar is bad for us, but according to new research we’re about to hit a health crisis if our habits don’t change. Professor Simon Capewell, from the University of Liverpool, has gone as far as labeling sugar “the new tobacco”. Health experts warn that sugar levels need to be reduced by up to 30% to prevent the obesity epidemic from growing. Professor Capewell says, “Obesity and diabetes already cost the UK over £5billion a year. Without regulation, these costs will exceed £50billion by 2050”. The maximum recommended sugar intake set out by the World Health Organisation is 10 teaspoons a day. On average, people in Britain are consuming 12 teaspoons a day, with some consuming as many as 46! Do you know how much sugar you’re consuming? Although it’s obvious that fizzy drinks contain a lot, did you know a Very Berry Latte from Pret a Manger weighs in at seven teaspoons? A small Starbucks caramel Frappuccino with whipped cream contains 11 teaspoons, so we’d think twice before opting for large again. It’s important to check the sugar content of all the food you eat, as you may be surprised by how much sugar your savoury meals contain. A small serving of Heinz Tomato Soup (300g) contains almost four teaspoons of sugar, while pasta sauce and sweet and sour dishes can also be high in the sweet stuff. Lidl has responded quickly to these concerns by removing sweets from the checkout at all 600 stores, after 70% of parents revealed they are pestered for sugary treats as they queued with their shopping. What can you do to reduce your intake? Start by focusing on making simple swaps to improve your diet. Sugary drinks to diet, sugar free or no added sugar drinks or to low fat milk or water. Cheese to reduced fat cheese. Butter to lower fat butters or spreads. Sugary cereal to low sugar cereal e.g. plain whole wheat cereal biscuits, plain shredded whole grain or plain porridge. Whole milk to semi-skimmed; or semi-skimmed to 1% fat or skimmed milk. Why not try all five? Reducing sugary drinks alone could save your family almost 300 sugar cubes a month. 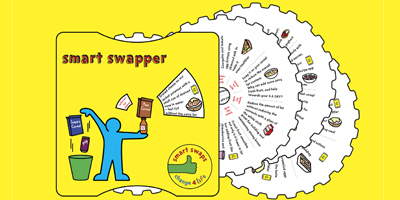 Visit Change4Life to get your free Smart Swap pack, whch includes tips, recipes and some money-off shopping vouchers. Follow us on Twitter @WomanMagazine and to let us know how you get on.